White House officials did not mention oil sanctions against Pyongyang, but said Trump and Moon broadly agreed on all major points in their 40-minute telephone conference Monday, a day after North Korea triggered a global storm of protest by detonating a nuclear warhead underground that it said was a hydrogen bomb. "Both leaders underscored the grave threat that North Korea's latest provocation poses to the entire world," a White House statement said. 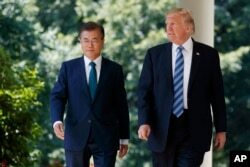 FILE - U.S. President Donald Trump walks with South Korean President Moon Jae-in to make statements in the Rose Garden at the White House in Washington, June 30, 2017. "The two leaders agreed to maximize pressure on North Korea using all means at their disposal," the statement continued, and "they also pledged to strengthen joint military capabilities." The United States will circulate a draft of a new resolution about North Korea at the United Nations this week, U.S. Ambassador Nikki Haley told an emergency meeting of the Security Council on Monday. American diplomats said they hope the resolution can be brought to a vote within one week. In addition to his extensive talks with Trump, South Korea's President Moon also conferred by phone Monday with Kremlin leader Vladimir Putin. Officials in Moscow said the Russian president advised that the only way to resolve the crisis on the Korean Peninsula is through diplomacy and negotiations. The United States, in specific warnings by Trump and Defense Secretary James Mattis, has told North Korea to expect a massive, overwhelming military response if it directly threatens the United States, its allies in Asia or the U.S. territory. President Moon took office in Seoul hoping to establish better relations with Pyongyang, but Kim Jong Un's repeated provocations — multiple missile tests and, most recently, its most powerful nuclear test ever — appear to have dashed those hopes. Trump criticized Moon on Sunday for what he called "talk of appeasement" for North Korea, but officials in both capitals took pains Monday to demonstrate they were united in their approach to North Korea. "President Trump gave his in-principle approval to South Korea's initiative to lift restrictions on their missile payload capabilities," the White House said, adding that Trump "also provided his conceptual approval for the purchase of many billions of dollars' worth of military weapons and equipment from the United States by South Korea." Trump has vowed to stop all U.S. trade with any country doing business with North Korea, and Treasury Secretary Steven Mnuchin is said to be working on details of such a plan, which would primarily target Pyongyang's neighbor and main trading partner, China. More than 90 percent of North Korea's export earnings come from China. Since U.S. trade with China is more than $600 billion per year, dwarfing trade between Pyongyang and Beijing, analysts are skeptical of the viability of the embargo Trump has proposed. They also doubt that Beijing would agree to a move that could cause the collapse of Kim Jong Un's regime. "For a variety of reasons, including concerns of implosion and collapse, concern over nuclear weapons, concern over human suffering and uncertainty over whether a trade embargo would change behavior, China and others aren't likely to follow the U.S. lead at this time," said Deborah Elms, founder and executive director of the Asia Trade Center in Singapore. "The worst result usually comes from a half-enforced trade embargo, which is what is likely to result now," Elms told VOA. Before the North Korean nuclear test, but after Pyongyang fired a missile over Japan and into the Pacific last Tuesday, Trump had signaled he was going to end the U.S.-Korea Free Trade Agreement (KORUS), as part of his efforts to revise or scrap economic agreements made by previous U.S. administrations that he feels were unfair to the United States. Trump's intended move aroused misgivings among business leaders in the U.S. and abroad. "With real-time and growing threats from North Korea's nuclear and missile programs, I cannot imagine a worse time for President Trump to bully an ally like South Korea with his nativist and transactional approach to trade," said Gordon Flake, CEO of the Perth USAsia Center and a member of the Korea Economic Institute of America advisory council. "The timing and tenor of the Trump administration's strategy on trade threatens not only the U.S.-ROK alliance, but will undermine U.S. credibility with other allies throughout the region," Flake told VOA. Scrapping the trade deal with South Korea has not won noticeable support from American corporations, either. "Our companies tell us that [KORUS] is a good deal as written," Tami Overby, the U.S. Chamber of Commerce's senior vice president for Asia, told a television interviewer at CNBC.